Whipping it up for HD consoles? 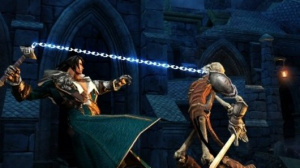 It's something of a bumper morning for Castlevania fans, as Konami producer Dave Cox has been giving interviews with several different sites regarding the forthcoming 3DS title Castlevania: Lords of Shadow - Mirror of Fate. We created everything in high definition - all the textures, all the levels, high-poly models, everything - and we kind of shrunk it all down into the 3DS. Then we lost bones from characters, you know, we dropped the resolution of the textures and everything to make it fit. At MercurySteam we have an HD version of the game sitting there in a computer somewhere. Absolutely, yeah. We would consider it. We want as many people to play it as possible. Obviously we have an exclusivity deal with Nintendo right now though and they've been very supportive of the product. Could this mean a Wii U version in the future? Let's hope so. Mirror of Fate already looks amazing on the 3DS; in HD it would be even more striking. Mirror of Fate launches in North America on March 5th, with the European release coming slightly later, on the 8th. No way, an exclusive is what keeps you from giving away your console, so what, should we all hope in a HD version of Luigi's Mansion 2, Animal Crossing NL and Fire Emblem Awakening? Would you rather them pull the wool over your eyes like Capcom did wirh Resident Evil? Yes, please. A Wii U version would be great. I really want to play the game, but I don't care enough for portable systems to get a 3DS. Day one purchase on 3DS, would be dope for Nintendo owners to have our home console version. "We created everything in high definition - all the textures, all the levels, high-poly models, everything - and we kind of shrunk it all down into the 3DS." This is what I keep hopeing Monolithsoft will say about Xenoblade Chronicles. I would have thought anybody making a Wii game over the past few years would have done so in HD in anticipation of an HD Wii or to port it to the PS3 or Xbox360. Bring it. I wish this would happen more. 3D + home consoles smells more like PS3 than Wii U. Also the developers chose 3DS over Vita due to the 3D effect. However I will get MoF even if it may not be the Castlevania I loved the previous years. How about releasing HD collection of the GBA and DS Castlevania games first. I would love to replay Circle of the Moon, Harmony of Dissonance, Aria and Dawn of Sorrow, Portrait of Ruin, and Order of Ecclesia all in glorified HD exclusively on Wii U. @retro_player_22 That is a cool idea actually! Not that it will be profitable an exclusive Wii U release though. I'd rather see LoS2 make its way to the Wii U instead of a port of MoF. to hell with small screens! I'd buy it. probably gettin this on my 3DS too. I'll be gattin RE:R on my wii u even though I have it on my 3DS but to be honest I liked it alot and the more games the merrier. Well so much for building hype for the 3DS version. They might as well be saying "Don't bother buying the 3DS version, just wait until we break exclusivity with Nintendo and make this for PS3 and 360 but not Wii U because well... It's Nintendo and we're a third-party developer, third-parties don't support Nintendo home consoles, everyone knows that."